Claims that the daughter of a chieftain of the Peoples Democratic Party, PDP, Alhaji Buba Galadima, is working for President Muhammadu Buhari has been dismissed by Galadima, who said she was only made a member of the board of film corporation. He explained that the appointment was not commensurate with his daughter’s contributions to the election of Buhari in 2015. 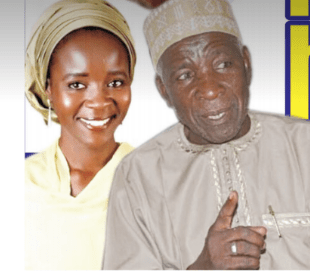 Galadima, who wondered why her daughter’s membership of the board should be seen as a big issue said his daughter has a long relationship with President Buhari. In an exclusive interview with Saturday Vanguard, he said the violence and alleged irregularities that marred the re-run governorship election in Kano were largely made possible by the caging of the state Police Commissioner. He explained that the police boss, who he described as a fair-minded person was rendered incommunicado on the election day. His words: “Those saying my daughter is working for Buhari are doing so simply to ridicule me. Let me start by saying this, ordinarily, my daughter is Buhari’s daughter also because by custom, whoever gave a girl out in marriage is her father. My daughter has a history with Buhari. Even when she was graduating in London, Buhari and I travelled to London for her graduation; when she was being given out in marriage, it was Buhari that gave her out in marriage. When she had her first child, he persuaded her husband to name the boy after him. “It is the greatest honour to give to a friend. However, my daughter is a matured Nigerian, married with children. She was a Councillor in Wuse. In 2015, she was the highest elected person in FCT on the platform of APC. She worked very hard with the vice president during Buhari’s campaign. In fact, she was the leader of his campaign in the FCT. To me, if she was to be compensated, she would have been made a minister and not an aide. By qualification, my daughter has two first degrees, three masters degrees. “There is no member of the Buhari’s government including himself that has that kind of qualification. But she was denied position in government. The position they were hyping in the social media was that she is a board member of the board of the film corporation in Jos.